Located in the Murcia region of Spain in the picturesque Ricote Valley, Real Homes offer a wide selection of properties in the sun ranging from luxury villas to old farm houses to restore. Established in 2003, we provide a unique personal service to all clients, helping to find exciting properties for sale in the beautiful Ricote Valley, Southern Spain. Our work starts by searching out and helping you to find the place of your dreams here in the spectacular Ricote Valley, close to the Costa Blanca and Costa Calida coast lines, anything from a town house to a rustic farm house ready for restoration, we have a wide variety of properties available including bank repossession and bargain properties. We are here to assist you with everything needed to secure that perfect inland Spanish property, maybe a modern Mediterranean style villa or a character old farm house. Our sale contracts are fully translated in both Spanish & English, and together we can arrange your NIE document, bank account, mortgage application, insurance as well as quotations for your wimming pool or building work, in fact everything that you may need to feel settled, happy & secure, in the all year round Spanish Murcian sunshine. Our service is highly individual. We drive you to view each and every property of your choice. We take the time to fully introduce the Ricote Valley and our range of local services, because we believe that finding the right friendly town in this colourful region, is as important as finding the right property. And that´s what makes a Real Home in Real Spain. Choose from a wide range of carefully selected inland property including stunning plots of land, enchanting fincas, casas, town houses, magnificent larger country houses, old farmhouses and cortijos, modern Mediterranean style villas with pools and bank repossessions, some to restore and some already finished in absolute luxury. The Ricote valley is situated in the South East Murcia region of Spain close to the Costa Blanca and Costa Calida sandy beaches. It is an area well known for the spectacular mountainous landscapes, with mile after mile of aromatic citrus groves, Ricote & Jumilla vineyards, scenic lakes, rivers and waterfalls. Besides the wonderful climate, loved and enjoyed by all, you will also find the ski slopes of the Sierra Nevada are not that far away. If golf is your passion, then this is definitely the place for you. There is an unrivalled choice of world class golf courses here in the province. The region is served by a network of motorways, good local roads, and airports in Alicante, Murcia (San Javier) and Corvera, all offering seasonal daily low cost economy flight options to UK and the rest of Europe. Remember, we are less than an hour away from international airports and beautiful sandy beaches. Owning your inland Spanish property here in the picturesque Ricote Valley located in Murcia will make family and friends want to visit you. Spain is one of the happiest countries in the world, according to the World Database of Happiness drawn up by the Erasmus University in Rotterdam. It puts Spain amongst the top 20 countries where people live a happy life for more years. Life expectancy in Spain is an average of 80.5 years and a recent Spanish government report (published August 2010) found the Murcia region to be the healthiest region, with the most temperate climate, and Blanca town (Ricote Valley), as being the healthiest town in Spain to live offering the longest life expectancy of anywhere in Spain. So, if its short mild winters, guaranteed lovely long summers, a lower cost of living, a colourful and culture rich lifestyle, in fact a whole new way of life for all of us - all ages, then you need look no further, the Ricote Valley will catch your attention, your imagination and your heart and you will not want to leave this magical place. Contact us now to arrange a viewing trip, we will be proud to introduce the Ricote Valley to you and show you a range of exciting properties that match your criteria and your budget. 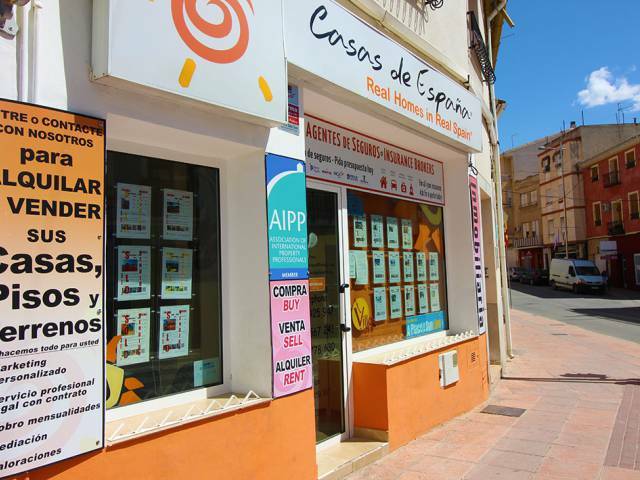 A warm welcome awaits you from all of us here in sunny Southern Spain at Real Homes in Real Spain. The municipality of Blanca is located in the area known as the Vega Alta del Segura; it borders Abarán in the North, Ulea and Ojós in the South, Molina de Segura and Fortuna in the East and Ricote in the West. It extends over 87.7 square kilometres and occupies 0.77 of the surface are of the Region of Murcia. Its average height above sea level is 233m and its population density is around 68 inhabitants per square kilometre. The ground is very uneven. There is a small valley that borders the Ricote mountains, the Sierra del Oro and Ricote at midday which forms a narrow pass with vertical walls: "El Solvente", where the river reaches the area of Ojós. The Northern border is found in the Sierra de Solán (556m), with a number of watercourses and ditches. To the North of this valley you can find an undulating plateau of ground which doesn't get higher than 300m, bordered in the North by the Sierra de la Pila ( El Pilón, 1264m) which extends over the municipalities of Abarán, Jumilla, Fortuna and Molina de Segura. The main riverbed is the Segura river, on the right hand side of which can be found the Tejera, del Puente, del Zapatero and del Pantano watercourses which originate in the Sierra de Ricote; on the left hand side, there is the San Roque watercourse. The climate is semi-arid and the ground is mainly loamy soil with alternating dark limestone. The inhabitants live between Blanca village and its districts: Alto del Palomo, Buyla, Huerta de Arriba, Tollos, Runes, Bayna and La Estación. It is of Arabic origins. It appears for the first time in history in 1281, under the primitive name of Negra, when prince Sancho promises to donate it to the Order of Santiago as thanks for the help received in the differences he maintained with his father Alfonso X. In 1383 the name of Blanca appears in a document by Martin Alfonso de Valdivieso, brought from the Kingdom of Murcia by the Count of Carrión to the council of Murcia, dated October 18, in which the liberty of a moor from Blanca is solicited from his appointment in the Ricote Valley, having been taken at the behest of a Jew from Elche. The Patron Saint's fiestas to honour San Roque take place on August 16, although on the Friday following Good Friday there is also a small pilgrimage to the Saint's nearby hermitage. The Patron Saint is Nuestra Señora la Virgen de Dolores (September 15) but it is not a local bank holiday: the Friday before Easter is more important. You cannot get to know Abarán in just one visit. You need to look hard for precious jewels but when you find them, it's worth all the effort. Abarán is located between two bends in a path. Even today, as its antiquity is eroded by time, you can still see how the first houses were built on the side of Solana hill between the Rulo ridge and the schools, between Calle Santa Teresa and Plaza de Don Jesús García Candel. The village grew continuously from when it was founded until the end of the twentieth century. First, Solana hill, via the Hortichuela path, today called Calle de la Artichuela. Then, in the sixteenth century, Eras hill, where buildings were erected and you can currently find San Pablo's church. Then Ermita hill, where a small temple to San Cosme and San Damián was built in the sixteenth century; this was replaced by the current one which dates from 1953. During the nineteenth century, Era mountain and the current Plaza de la Zarzuela and their surroundings were developed. Later, in the second-half of the twentieth century, Cabezos de la Cruz and the Civil Guard Headquarters were developed. So grew a village characterised not only for its narrow steep slopes but also for the difference in height between two pavements in the same street, something which would have an effect on the construction of most of its houses and thoroughfares. All due to the fact that the flattest part of the 'untouchable' countryside, below the waterline of the irrigation channels, was essential for maintaining agricultural activity. We had to wait until the last third of the twentieth century to start building on the irrigated terraces. It is in these difficult-to-expand areas that generations of people have lived over time. This age-old village settlement has turned a collection of streets and houses into one. There are certain streets which hold a special place in villager's lives. At certain times of the day, Abarán's men had their meeting places. The Plaza Vieja was the first of these, then the Calle Mayor del Médico Gómez where it crosses Luis Carrasco. Later on you had the Calle San Damián and, finally, the Era or Plaza de la Zarzuela. The places where the village's men meet change in the same way as the village expands, always further upwards. The same thing happens to the places where married couples and youngsters go for walks. The first of these places is the Camino del Agua - Calle Menéndez Pelayo, then the Ermita at the start of the twentieth century, then the Era and, when cars arrived, Calle Dr. Molina. Both the men's meeting places and the places where people go for walks are spaces which have adapted themselves to the new streets, cinemas, theatres, taverns and bars. This is how the Abarán of the twenty-first century was built, with part of its countryside used for new constructions, trying to adapt to the new multi-home buildings which turn streets into roads. Environmental transformations which affect the population and cause them to change their habits and which will see a way of life disappear into the past. The only town in the Ricote Valley that is not located on the banks of the Segura river is Ricote and like the other towns in the valley it enjoys a privileged natural environment, an eventful history and an enviable cultural and artistic heritage that has been developed over centuries. Its origins are protohistoric, as the region's archaeological finds show, and have their origins in the Bronze Age and have uninterrupted continuity through Iberians, Romans, Visigoths, Muslims and Christians until now. Even so, Ricote was first documented by the Muslims in the year 896 when mention of the Al-Sujayrat castle was recorded. In the shade of its walls, Ibn Hud rose against the Almohads in 1228 with a plan for Hispanic / Muslim rebellion against the rigorous North African kings and showed leadership that would allow him to take control of most of Muslim Spain. In the thirteenth century the village must have had a flowering economic and cultural life as reflected in the characters of the day, amongst whom we could highlight Al-Raquiti who, after the conquest of Murcia by Alfonso X, was placed at the head of a study centre thanks to his excellent academic training in all academic disciplines and knowledge of the age. He taught Christians, Jews and Muslims in their own vernacular. Superior to Al-Raquiti was Muhammed Ibn Sabin who was also born in Ricote. As a sage and Sufi mystic with a deep cultural knowledge and spiritual life that led him to establish a new theological line within the framework of Sufi spirituality called Sabini. He was admired by Kings, Caliphates and Popes and created a school and tradition in the Ricote Valley. The Orden de Santiago decided the fate of the valley after 1285, establishing a feudal social, political and economic structure in which both of the social groups located in the valley were included: the sovereign structures of the Order and the Muslim councils and good men of the valley who decided on the fate of the Mudéjars. With their conversion at the end of the fifteenth century, the Morsico minority appeared and was active under the care of the Orden de Santiago, as well as a marked historiographic activity, having been the last remaining Moriscos expelled from Spain. The most important part of Ricote's cultural heritage is the eighteenth century San Sebastián church, built according to the strictest guidelines of Baroque ideals and containing two fifteenth century statues of Salzillo and another of San Sebastián, whose name honours the parish, anonymous paintings from the eighteenth century, an organ donated by the Llamas family in 1743 and constructed by Joseph Meseguer, as well as several architectonic and sculptural elements which enrich and ennoble it. The 1702 Palacio de Llamas is notable for its façade, the noble staircase and the railings. The Casa de Hoyos and the Palacio de la Encomienda complete the urban make up of suggestive, winding, narrow streets that give away Ricote's medieval origin. In the heart of the Ricote Valley can be found the ancient village of Ojós, the old Oxox of unknown origin, as its roots go back to prehistoric times. In the immediate surroundings you can find the remains of an important late Roman period town that was later destroyed. The current country house was already documented by that name in 1281 along with a large fortress called the Peñas de Oxox castle. From 1285 until the middle of the nineteenth century it belonged to the Orden de Santiago, integrated in the Encomienda del Valle de Ricote. It was a village that never had a lot of inhabitants due to the small surface area on which its houses are built, surrounded on one side by the fields which sustain it and on the other by mountainous terrain. The centre of the old town is without doubt the most picturesque of the area as it conserves in a practically unaltered state the old medieval layout with very narrow, winding streets. The village was politically dependent on Ricote and gained municipal independence in 1501 when its Muslim inhabitants converted to Catholicism, the Muslim council was replaced by a Christian one and the Muslim mosque by a parish church, which was rebuilt and expanded in later years. To visit the area of Ojós is to discover different sensations with each step you take around different landscapes and places of interest. If we further investigate the country house, decorated with hundreds of colourful, flower-filled flower pots and plants, the visitor will be continually surprised. The visitor will find many things to see, amongst which we could highlight the stone crests of the main families, the Massa, Pérez, Marin, Melgarejo and Hoyos. In the old public washing area, the visitor will be able to see some women washing their clothes just like in the olden days whilst they chat to each other about local gossip. Don't hesitate to visit the old church of Saints Felipe and Santiago where valuable sixteenth century and later images of Patrón de la Villa, San Agustin and others can be seen. In the surrounding area, if you go for a walk, you will be able to visit the Puente Colgante, an old "Cot" restored in 1998, the fields and border areas of the Segura river. Coming back to the town via the Avenida Rio Segura, we find the cultural centre "Tomás López de Poveda", a name it bears in honour of a charitable character whose memory is engraved on two stones in a house in the Calle Mayor. You will next arrive at Plaza del Rulo where they used to process the esparto grass and then, further up the Jardín del Peñón, which boasts a faux Roman theatre. But above all this village can boast an authentic, natural water museum, with the Ojós waterwheel, the Mayés dam, several other waterwheels, irrigation channels and ditches, the old flour mill and the materials press (the so-called "Casa de los Mazos"). You will be able to stay in several rural houses, go fishing or take photographs and, in the nearby hills, go walking and take part in other mountain sports. Don't forget to make a stop at the Salto de la Novia and get to know the medieval legend. And finally, as a last piece of advice if you can, try the famous "drunken biscuits". I'm sure that when you leave you will never forget Ojós and its people. Cieza is a town and municipality in Spain, in the autonomous community of Murcia. It is the capital of the Vega Alta comarca, an old form of provincial subdivision).The Segura River passes through the town. The local economy is based on agriculture; mainly in the cultivation of peaches and olives. Cieza, in every street, path, garden or mountain displays its beauty by opening up the traveller's appreciation of the senses. Its Palaeolithic and Neolithic remains are unique to the Mediterranean fringe and its examples of cave paintings have been declared of World Heritage by UNESCO. The Iberians and Muslims also left their mark, the latter in the archaeological collection of Medina Siyasa. Evidence of these cultures are preserved in the Museum of Siyasa. Other outstanding monuments are the Church of the Assumption from the eighteenth century; the Church of St. Joaquin, built in the seventeenth century; the Convent Church of the Clarissas, dating back to the eighteenth; the Hermitage of the St. Cristo del Consuelo (Holy Christ of Solace), with its Neogothic-Mudejar style, and last, but not least, the Hermitage of the Buen Suceso. Its artistic heritage is completed by the Balcon del Muro, a historical centre which consists of the ancient fifteenth century fort and the nineteenth century wall. Cieza offers the chance to not only appreciate its culture but also to enjoy the risks of Nature. Near this town we can found one of the most remarkable natural beauty spots, the Almadenes Canyon, formed by the River Segura as it narrows creating a gorge with walls hundreds of metres high, which is ideal for practising adventure sports.